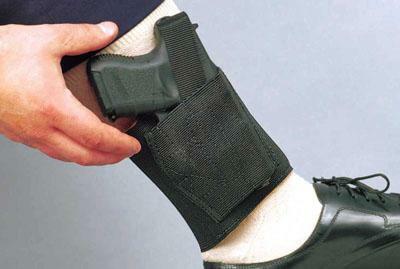 The Apache's wide, elasticized leg band largely eliminates the unwanted rocking motion commonly associated with ankle holsters. The Apache is made for small, medium and large frame semi-autos and small frame revolvers. All semi-auto models feature an adjustable Velcro thumb break. Revolver and .32cal holsters feature an adjustable thumb strap (without snap, Velcro closure). Designs may vary. Semi-auto and revolver holster models are constructed with elastic and have a sheepskin lining with a snap thumb break. The .32cal holster models are constructed of neoprene and feature a Velcro thumb break.